Although we provide a Standalone application called gdsctools_anova, the most up-to-date and flexible way of using GDSCTools is to use the library from an IPython shell. This method (using IPython shell) is also the only way to produce Data Packages. In this section we will exclusively use Python commands, which should also be of interest if you want to look at the Notebooks section later. We assume now that (i) you have GDSCtools installed together with IPython. If not, please go back to the Installation section. (ii) you are familiar with the INPUT data sets that will be used hereafter. Before starting, we first need to get an IC50 data set example. Let us use this IC50 example test file. More details about the data format can be found in the Data Format and Readers section as well as links to retrieve IC50 data sets. This is better coding practice and has also the advantage of telling beginners which functions are going to be used. As you can see you can get some information about the IC50 content (e.g., number of drugs, percentage of NaNs) using the The print statement function. See gdsctools.readers.IC50 and Data Format and Readers for more details. that should open a new tab in a browser redirecting you to the HTML help version (on ReadTheDoc website) of a function or class (here the IC50 class). One of the main application of GDSCTools is based on an ANOVA analysis that is used to identify significant associations between drug and genomic features. As mentionned above, a first file that contains the IC50s is required. That file contains experimentall measured IC50s for a set of drugs across cell lines. The second data file is a binary file that contains various features across the same cell lines. Those features are usually of genomic types (e.g., mutation, CNA, Methylation). A default set of about 50 genomic features is provided and automatically fetched in the following examples. You may also provide your own data set as an input. More details about the genomic features data format can be found in the Data Format and Readers section. 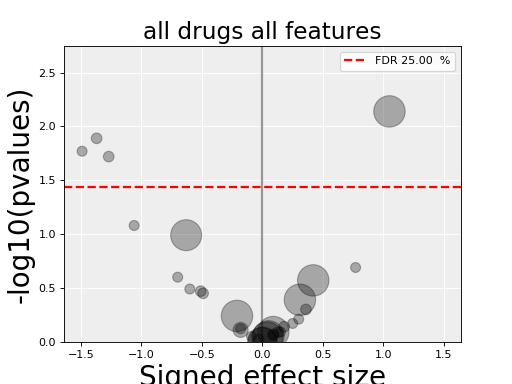 There are now several possible analysis but the core of the analysis consists in taking One Drug and One Feature (ODOF hereafter) and to compute the association using a regression analysis (see Regression analysis for details). 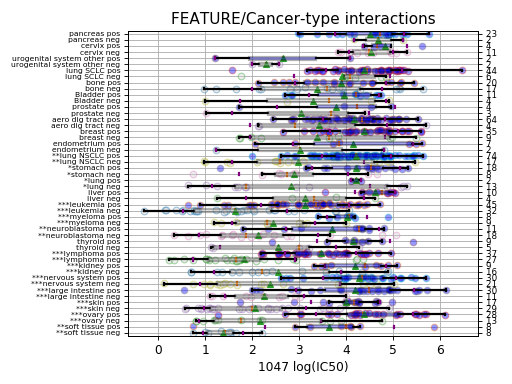 The IC50 across the cell lines being the dependent variable and the explanatory variables denoted are made of tissues, MSI and one genomic feature. 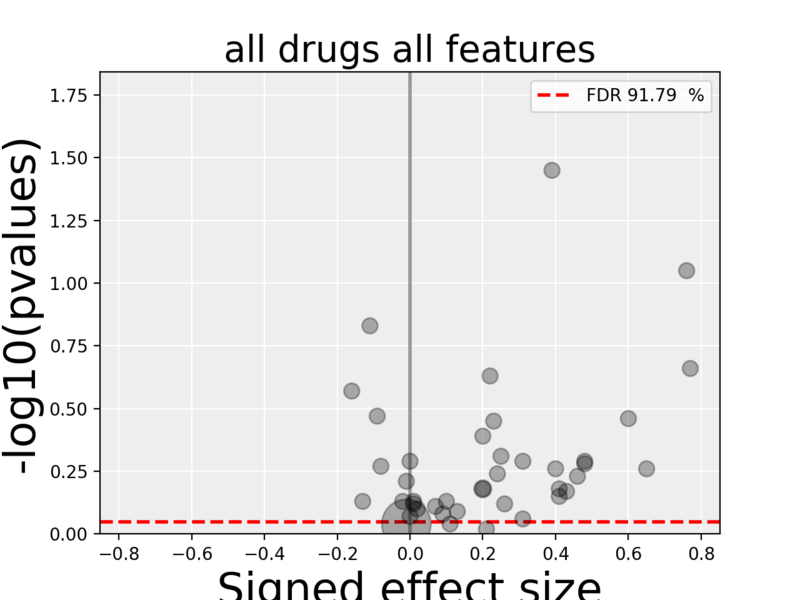 Following the regression analysis, we compute the ANOVA summary leading to a p-value for the significance of the association between the drug’s IC50s and the genomic feature considered. This calculation is performed with the anova_one_drug_one_feature() method. We will see a concrete example in a minute. 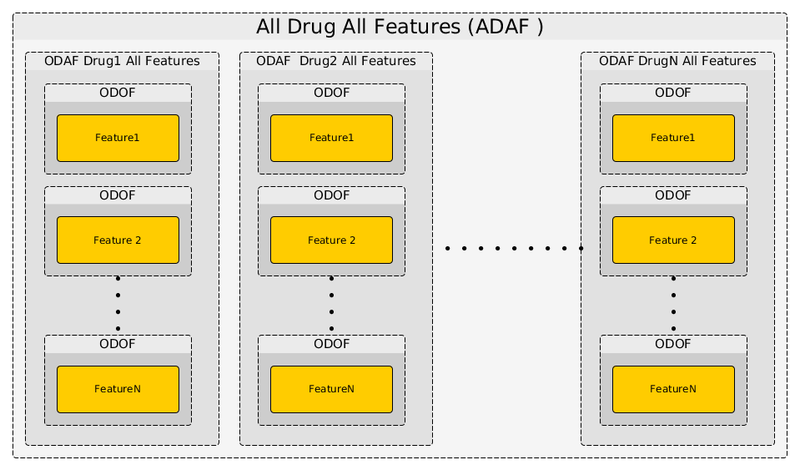 Once an ODOF is computed, one can actually repeat the ODOF analysis for a given drug across all features using the anova_one_drug() method. This is also named One Drug All Feature case (ODAF). 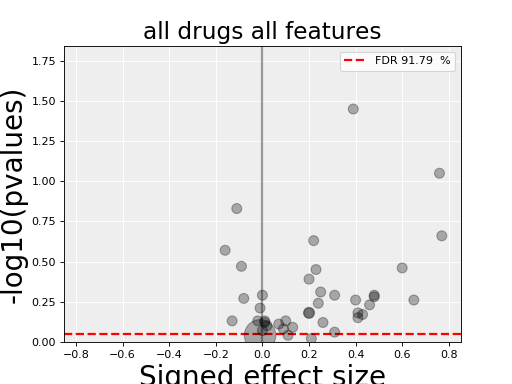 Finally we can even extend the analysis to All Drugs All Features (ADAF) using anova_all(). The following image illustrates how those 3 methods interweave together like Russian dolls. The computational time is therefore increasing with the number of drugs and features. Let us now perform the analysis for the 3 different cases. 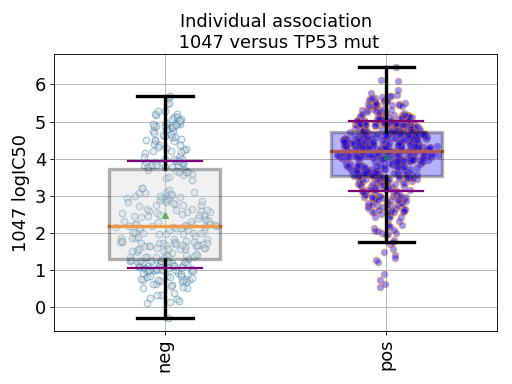 Setting the show parameter to True, we created a set of 3 boxplots that is one for each explanatory feature considered: tissue, MSI and genomic feature. If there is only one tissue, this factor is included in the explanatory variable is not used (and the corresponding boxplot not produced). Similarly, the MSI factor may be ignored if irrelevant. In the first boxplot, the feature factor is considered; we see the IC50s being divided in two populations (negative and positive features) where all tissues are mixed. In the second boxplot, the tissue variable is explored; this is a decomposition of the first boxplot across tissues. 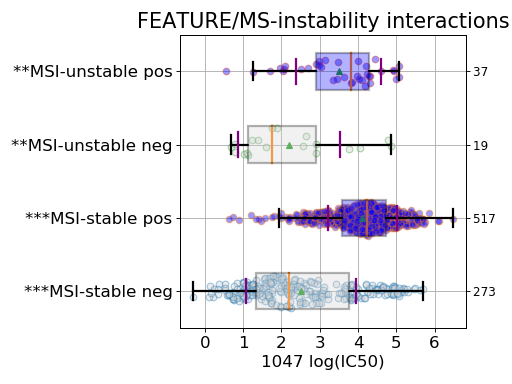 Finally, the third boxplot shows the impact of the MSI factor. Here again, all tissues are mixed. 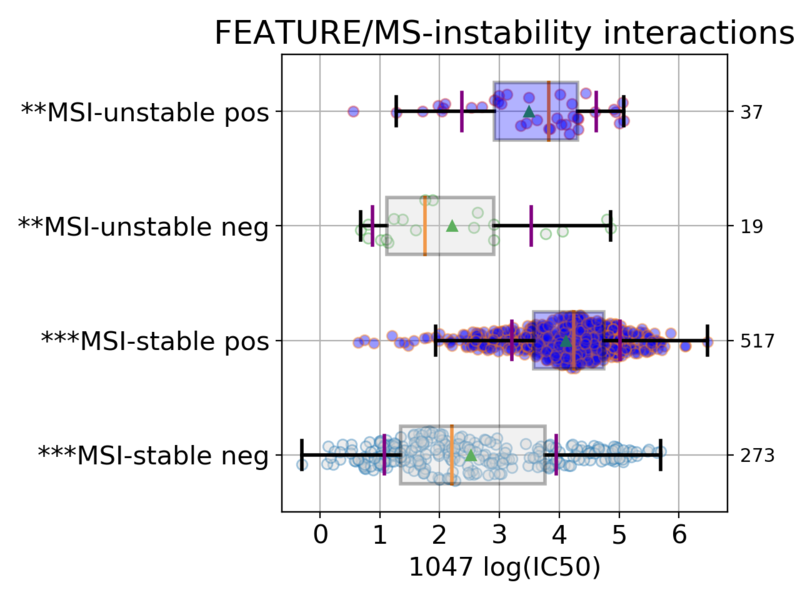 In the MSI column, zeros and ones correspond to MSI unstable and stab le, respetively. The pos and neg labels correspond to the feature being true or not, respetively. 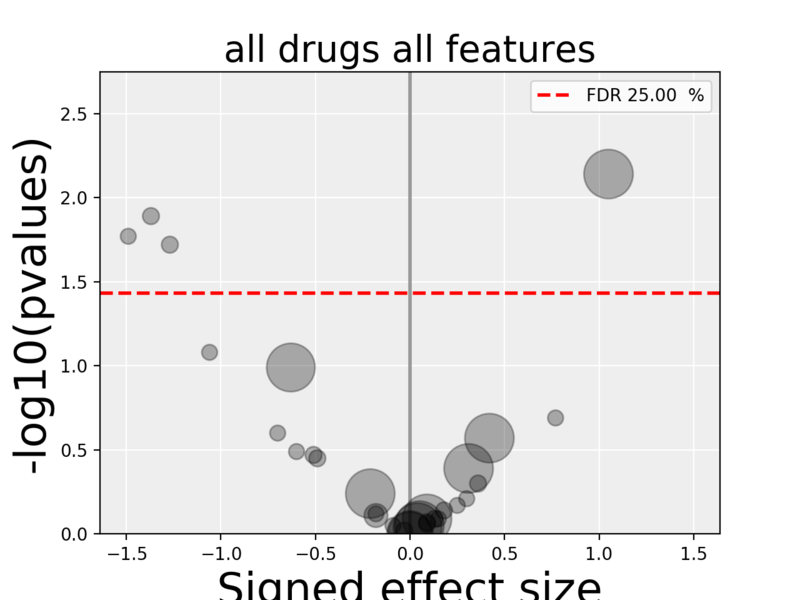 The output of an ODOF analysis is a time series that contains statistical information about the association found between the drug and the feature. See for gdsctools.anova_results.ANOVAResults for more details. The best is to do it in one go though since it will also fill the FDR correction column based on all associationa computed. In a python shell, you can click on a dot to get more information. Here, we have a different plot called a volcano plot provided in the gdsctools.volcano module. Before explaining it, let us understand the x and y-axis labels. Each row in the dataframe produced by anova_one_drug() is made of a set of statistical metrics (look at the header results.df.columns). It includes a p-value (coming from the ANOVA analysis) and a signed effect size can also be computed as follows. and is the effect size function based on the Cohens metric (see gdsctools.stats.cohens()). In the volcano plot, each drug vs genomic feature has a p-value. Due to the increasing number of possible tests, we have more chance to pick a significant hit by pure chance. Therefore, p-values are corrected using a multiple testing correction method (e.g., BH method). The column is labelled FDR. Significance of associations should therefore be based on the FDR rather than p-values. In the volcano plot, horizontal dashed lines (red) shows several FDR values and the values are shown in the right y-axis. Note, however that in this example there is no horizontal lines. Indeed, the default value of 25% is well above the limits of the figure telling us that there is no significant hits. Note that the right y-axis (FDR) is inversed, so small FDRs are in the bottow and the max value of 100% should appear in the top. P-values reported by the ODOF method need to be corrected using multiple testing correction. This is done in the the ODAF and ADAF cases. For more information, please see the gdsctools.stats.MultipleTesting() description. Here we compute the associations across all drugs and all features. In essence, it is the same analysis as the ODAF case but with more tests. 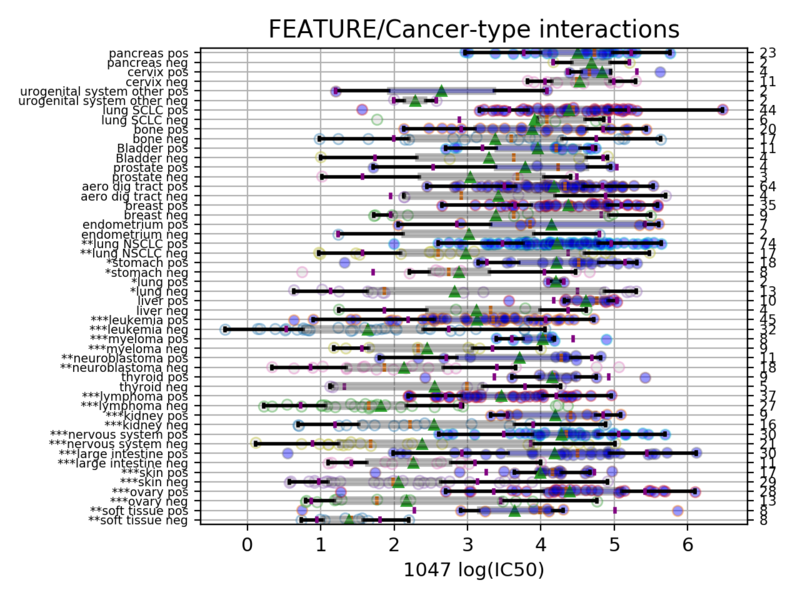 In order to reduce the computational time, in the following example, we restrict the analysis to the breast tissue using set_cancer_type() method. This would therefore be a cancer-specific analysis. If all cell lines are kept, this is a PANCAN analysis. The information about tissue is stored in the genomic feature matrix in the column named TISSUE_FACTOR. anova_all() may take a long time to run (e.g., 10 minutes, 30 minutes) depending on the number of drugs and features. We have a buffering in place. If you stop the analysis in the middle, you can call again anova_all() method and previous ODAF analysis will be retrieved starting the analysis where you previously stoped. If this is not what you want, you need to call reset_buffer() method. The volcano plot here is the same as in the previous section but with more data points. The output is the same as in the previous section with more associations. About the settings also covers how to set some parameters yourself. Creating HTML reports from the analysis: HTML report. Learn more about the input Data Format and Readers . How to reproduce these analysis presented here above using the Standalone application. Get more examples from IPython Notebooks. How to produce Data Packages and learn about their contents.